Title: 'Angliae regni florentissimi noua descriptio, auctore Humeredo Lhuyd Denbygiense'. Cologne, John Bussemacher. 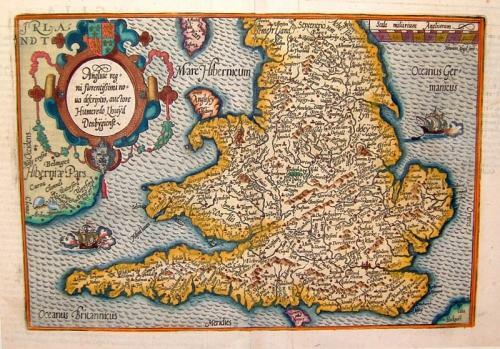 A charming map of England and Wales. Matthias Quad drew very closely on the preceding Humphrey Lhuyd-Ortelius map for this map. SHIRLEY: British Isles 172, illus.